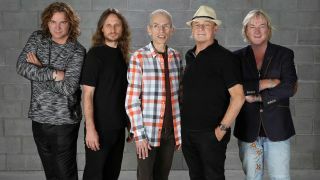 Yes have cancelled the remaining dates on their North American Yestival tour following the death of Virgil Howe – the son of the band’s guitarist Steve Howe. Yes announced the news on Facebook earlier this morning. Their statement reads: “Due to the tragic, unexpected death of guitarist Steve Howe’s beloved younger son, Virgil, Yes regrettably announces that the remaining dates of their Yestival tour have been cancelled. “Ticket refunds for the affected tour dates in Moorhead, Cedar Rapids, London, Rochester, Boston and Huntington will be available at point of purchase. “Yes – Steve Howe, Alan White, Geoff Downes, Jon Davison and Billy Sherwood – want to thank all their fans for their support and understanding at this time. Multi-instrumentalist Virgil was a member of The Dirty Feel, whose singer Nick Hirsch died in 2012, and also played with Little Barrie and Amorphous Androgynous. He and his father had collaborated on Nexus, a new album which is due to arrive on November 17 via InsideOut. Find a list of affected Yes dates below.